First of all let me explain that this is not the official web site of the Carnival of Venice. 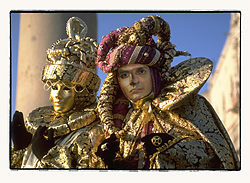 It is just a tribute that I, artist and photographer Roberto Delpiano am offering to this wonderful carnival in the wonderful town of Venice. It has been developed as a present to the internet community, to showcase all the "good and wonderful and fun" the Carnival of Venice can offer to whom is going to participate to it, or just surfs there. Of course, since I am a professional photographer and graphic designer, all the pictures you will find in these pages and all the others that you will find in the PDF files format - free for download files in the DOWNLOAD section - are fruit of hard work and my devotion to the carnival, but it won't hurt if I receive monetary compensation for my work. Almost all graphics, reproductions and photographs that you will find in these pages I have as high quality High Resolution image files in my archives, and rights for publication can be purchased. Please do, it will help to pay my rent, my research time and my living expenses. You will find in these web site highlights of what's in the historical background of the carnival. The Carnival in Venice is no "goof", no "consumeristic ceremony" as some people complain, but sincere, wonderful heartfelt tradition that goes back in time almost a millennium, and despite its age, still shows its vitality to whom participates to it in person or in spirit.